Texting My Pancreas: #GiveAllTheThings: Glucose Gels. @barbiep63: As a teacher, it is important to keep my BG's LEVEL. These would be great on the go with my kids! I'll be tweeting you shortly! Today marks the last day of Give All The Things!, and I have two giveaways today - these are even more rapid-fire, so don't miss the deadline! This contest will only be open for about six hours! Product: A "starter kit" of glucose gels! Why you want this: I got to try some of these at FFL this year, and thought the strawberry banana was pretty yummy. At exactly 15g of fast-acting carbs per pouch, I imagine that athletic types would find that these fit the rule of 15 better for their lows than some other gel packs. 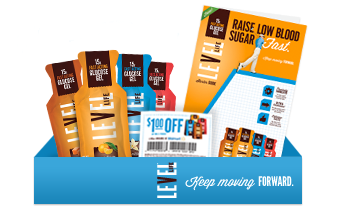 To enter today's giveaway contest: Use the word "level" when you leave a comment below. Be sure that your comment is time-stamped before 2:00 pm CST, because that's when I'll be drawing the winner! This post will be updated shortly after that time, with the name of the winner (who needs to be someone with a U.S. address). The Level Life Gels are great. Last week I woke up to a 43bg at 3:30 a.m., downed a pouch of Orange and 8:00a.m. reading was 119. My CVS only stocks orange and strawberry/banana, I wish the caramel was easier to find. I like glucose gels the best, because as I try to reign in my BGs even closer to an even level, I find myself falling from said level more than ever. Please and thank you. I'm hoping to improve my blood sugar levels by adding exercise into my weekly routine. Having gels on hand while running would put my mind at ease! I would love to have level bgs. Ive had these in orange and carmel. Would love to try other flavors! These would work great for keeping my blood sugars level, while i try to get my A1c down. To help me live a healthier life. We only dream of level BGs for our daughter, but would love to try the glucose gel for lows! A level line on my CGM is what I aim for...and that sometimes involves eating products such as this! I've tried the orange, would love to try other flavors. I woke up this morning to a totally level line on my overnight CGM. Awesome! For nights that are unlike this, I'd love to try some gels. As a teacher, it is important to keep my BG's LEVEL. These would be great on the go with my kids! My sugars have not been level the last couple of days, maybe these would help me come up but not sky-rocket! I'm on a constant quest for the perfect treatment to bring up a low and LEVEL it off instead of sending my BG into the stratosphere. Enough with the roller coaster! I tend to always overeat when I'm low, so maybe these glucose gels would help me stay level. These would be great to keep my blood sugar at the right level. These are amazing and bring my BG up and level quickly!